I have very fond memories of Easter. I remember my family’s preparations, starting with the big spring cleaning, the decorating, the cooking. My grandma always filled the house with flowers from the garden, forsythia, daffodils and tulips. I loved the colors, and to this day these flowers bring a smile to my face. For us kids, Easter was always exciting because we were allowed to stay up late and go to midnight mass. I remember dressing up, walking to church, joined by hundreds of people. Because the crowds were so large, mass was oftentimes held on the church steps so that everyone would see and hear. The sense of peace and community, it was almost palpable. At the end of mass, the priest “gives light”, meaning he lights someone’s candle (everyone brings one), and this person lights someone else’s and so forth, until everyone’s candle is burning. You take the candle home, as it is supposed to light your way for the coming year. You have to imagine a sea of people with burning candles slowly and silently making their way home. It’s a magical sight. And on Sunday you feast. Of course the other important Easter tradition was the painting of the Easter eggs. I loved it, what kid does not? When I moved to Canada one of my most cherished mementos I took with me was this hand-painted Easter egg. There are very talented artisans in Romania that specialize in this type of “painting”. I am preparing for A.’s first Easter-egg coloring experience. I’ve done my research on using natural dyes, and I promised him he can use Spider-man stickers to decorate….not exactly traditional but hey, it makes him happy. 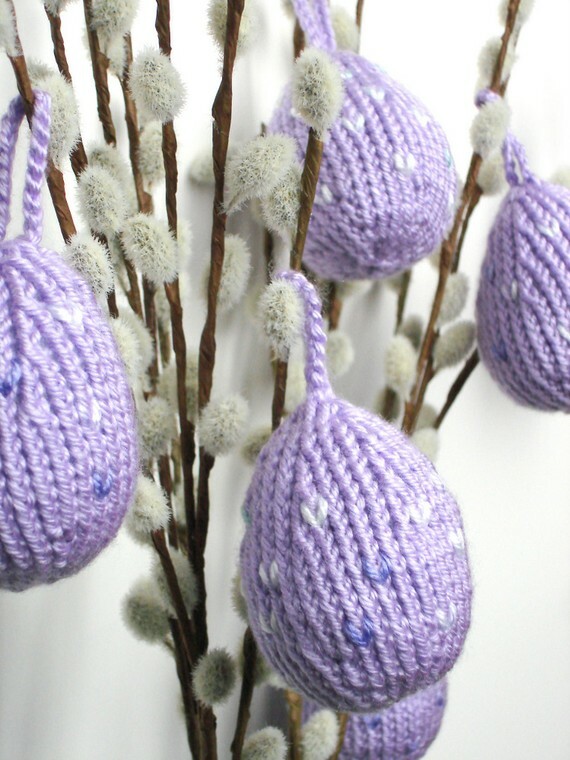 As I am not much of a painter, I knitted my own Easter eggs (you may have seen them in my Etsy shop). I think they will make a beautiful centerpiece, and when A. is older, we can even use them for an Easter egg hunt. love the eggs! beautiful sentiment about easter. Your Easter memories sound so beautiful - must have been breathtaking being part of all those lights. Love your eggs and can't wait to see your naturally dyed ones, and to hear what you used for dying them. so you're from Eastern Europe ? I remember my Polish grandma had some similar painted eggs from her Russian relatives... but I didn't grow with her I was raised by my maternal grandmother. The Easter lunch was a big deal and the time for a prayer. it would always end by a rum baba that I still bake now that i've lost my grandparents, for my family. ps : your knitted eggs are SO pretty ! What wonderful easter traditions your family had. I like your easter eggs - both painted and knitted.